When is it necessary to replace an A/C system? It really depends on the age of the A/C and its current condition. The time when it is best to replace an air conditioner depends on how many years have passed since the original installation date and whether it would cost less to repair or replace the A/C system. To determine when it would be best to replace your central air system, consider the options in the scenarios covered in this article. Air conditioners are not built to last forever. In fact, an A/C will last the same amount of time as the average residential occupancy — roughly 10–15 years. Beyond that point, an A/C system is liable to show an increased number of problem symptoms that can lead to costly repairs. As these problems become more frequent, the more economical choice might simply be to replace the central air system. One of the biggest red flags of a faltering A/C system is when it requires some major set of repairs merely one year after you last had the unit serviced. If you sank several hundred dollars into your central air system last summer and now it is already failing, chances are this will be an ongoing pattern at the start of every warm season. Repair: If the air conditioner is less than 10 years old, it is generally best to have the system serviced when the system shows signs of inefficiency or dysfunction. Replace: If the system is more than a decade old, the A/C is likely living on borrowed time. Even when you have it fixed, it will probably display more issues just a few years down the line. If the A/C is more than 15 years old, it would probably be better to replace the unit. Basically, if an A/C hasn't reached its full life expectancy, do what it takes to keep the unit in good working condition. If the A/C has exceeded its life expectancy, it's probably time to get it replaced. Take the total cost of repairs and multiply that number by the age of your current system. If the total exceeds the average cost of a new system ($5,000), a replacement would be your best option. If the total falls under that amount, have the system repaired instead. Consider the situation of a 10-year-old system that needs $450 in repairs. Going by the 5,000 rule, the system in question is worth having maintained because the repair costs multiplied — $450 x 10 = $4,500 — won't exceed the threshold. Basically, an air system that can be repaired for less than the cost of a new one will likely have enough life ahead of itself to merit the price of repairs. By contrast, a faulty system that exceeds the 5,000 Rule is liable to cause further costly problems in the years ahead because the A/C is already on borrowed time. When refrigerant must be replaced, the issue is usually symptomatic of a coolant leak, which is a serious problem for any A/C unit. On older air conditioners, R-22 — alternately known as Freon — is the refrigerant used to condition air at desired temperatures of coolness. The trouble is, R-22 is being phased out by manufacturers due to its emission levels and is, therefore, more costly to replace in ailing units. Repair: If the A/C system was installed in the late 2000s and uses R-22 — manufacturers stopped producing Freon-based systems in 2010 — and the cost of repairs falls under the $5,000 threshold, you might be able to get another half-dozen-years worth of performance from the A/C with new refrigerant. Replace: If the A/C is already on borrowed time, your best option is to replace the system. 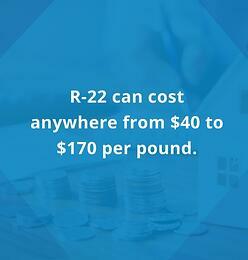 R-22 could be a pricey investment for an old system that is liable to have numerous other issues in the upcoming years. To reduce carbon emissions and render A/C systems more efficient, newer A/C systems use R-410A — a longer-lasting and environmentally-friendlier alternative to R-22. Heating and cooling costs are liable to fluctuate year-to-year as weather patterns change and electric companies charge more for their services. That said, you can tell that something is up with your energy consumption if you see uncharacteristic spikes from one month to the next in your energy bills. If the difference between May and June is a $20 jump in your energy bill — as opposed to the typical $5 increase between spring and summer — you are probably consuming too much energy. The question is how. If you continue to make sensible use of your air system and costs continue to rise despite there being no announcement of a rate increase or any serious changes over the prior year's seasonal weather patterns, the problem is likely due to your air system. Repair: If the system has not surpassed its lifecycle and falls well under the 5,000 threshold, have the A/C repaired. Replace: If the system is on borrowed time and approaches the 5,000 threshold, the added energy costs and inevitable future performance problems are liable to be costlier than a new A/C system. Conclusion – soaring energy costs can add up over the course of a year. When combined with the periodic repairs that older air systems require, a new A/C could be a bargain by comparison. When you first experience the comforts of an A/C system, the difference it makes to the humid ambient air is like night and day, especially if you have previously had to cope with exceedingly hot conditions. As time goes on and you grow accustomed to the adjusted indoor temperatures, the feeling becomes second nature. Consequently, you might be slow to notice if the air system gradually loses its effectiveness. Repair: If the system has yet to reach its sell-by date, consider this a simple maintenance investment. Replace: If the A/C is getting old, maintenance could be a short-term fix to a long-term problem that is liable to cost more each year. Remember, there is a difference between a faulty A/C and a failing A/C. If you have had the same air system for more than a decade, you might have had the system serviced two or three times over the years. If you suddenly need to have it serviced again just months after the last round of maintenance, that is an indicator that the A/C is in for greater problems. Repair: If the system is young and it needs a second or third round of repairs in the space of a year or two, consider having the A/C inspected by a different service specialist. Possibly, the system's performance issues were not properly diagnosed the first time. Replace: If the system is old and repairs have become an annual or biannual necessity, the money you are liable to spend in a year just to keep the A/C running could well exceed the 5,000 threshold. Back-to-back A/C problems could mean one of two things — the system wasn't thoroughly diagnosed and repaired the first time or it's approaching the end of its lifespan. When strange noises come from unexpected sources, it should often be taken as a warning. Just as odd noises from your car's engine should serve as a red flag, so too should unusual sounds from your air system. If the air conditioner makes excessive noise, the issue could stem from an insufficient duct system. In large houses, this often boils down to the size of the air system in relation to the dimensions of the house. Simply put, an A/C is liable to make noise if the duct system is too small for a house's interior square footage. Repair: If the air system is fairly new, an investment in the matter could preserve the A/C for a number of years to come. Replace: If the A/C is already more than 10 years old and the problem is due to a disproportionate duct system, the 5,000 rule is likely to favor an investment in a new air system. In any case, loud and strange noises from an air system should always be taken seriously. Most people wouldn't correlate the presence of excess dust with A/C issues. However, dust buildup can, in fact, result from problems with the ductwork. If your household fixtures and furnishings have been accumulating dust at greater frequencies than before, the problem could stem from leaks in the duct system. Once the ducts develop leaks, efficiency is lost from the air system because the A/C is forced to strain itself to maintain sufficient levels of coolness. If the problem continues unchecked, your energy bills are liable to rise — another indicator that something is wrong with the A/C. Repair: As always, an air system that is less than 10 years old should be inspected for duct leaks and repaired in the likelihood that cost estimates don't exceed the 5,000 threshold. Replace: With older air systems, leaky ducts are as good an indicator as any that the time has come to invest in a new A/C. Rule of thumb — an A/C is built to produce cool air, not dust. As a consequence of climate change, extreme temperatures at both ends of the spectrum have been experienced throughout much of the world. Across the United States, residents have been faced with hotter summers and colder, harsher winters. Consequently, people are leaning much more heavily on their air systems to combat July/August conditions in excess of 100°F. If the summers have gotten progressively hotter in your area over the past several years, increased demands have likely been placed on your air conditioner. To maintain peak performance, the A/C must be up-to-date and proportional to the interior dimensions of your house. Otherwise, the air system is liable to exhibit performance issues. Repair: If the system is less than a decade old and, better yet, utilizes R-410A refrigerant, invest in maintenance to keep the A/C running through the next several spring/summer seasons. Replace: If the A/C is approaching the 10th anniversary of its installation and uses outdated R-22 refrigerant, consider investing in a more robust air system. Remember, an air system that kept you comfortable when local temperatures peaked in the 80°F to 90°F range will have to exert more power to remain effective if temperature peaks shift to the 90°F to 100°F range. Perhaps you live in a climate where temperatures remain in excess of 75°F for much lengthier stretches of a given year. If the weather in your area typically soars into sunny warmth by mid-March and doesn't let up until mid-October, you probably rely on your air conditioner twice as much as residents in more northern areas. In hotter climates, air systems face greater demands and must be equipped to meet these challenges. If you ultimately need to use your A/C six or seven months out of the year instead of three or four, you are liable to run into performance issues sooner and possibly at greater frequencies unless the system is equipped for more intensive usage. Repair: A newer system with R-410A refrigerant is better equipped for lengthier usage cycles over the course of a given year and should, therefore, undergo maintenance to ensure a maximum lifecycle. Replace: An older air system with outdated refrigerant could wear out more quickly in a hotter climate with lengthier spring/summer seasons. As such, investing in a new A/C could save you money in the years ahead. Rule of thumb — if you use something twice as much, it is liable to wear out twice as fast. Air systems are designed according to the interior dimensions of a given house. Effectively, the air conditioner is sized by the square footage of space that it must condition. When a house is newly built or renovated, the size and reach of an A/C should be determined by the amount of air that the system will need to move. Consequently, the dimensional requirements of an air system change when you make additions to the space and square footage of your house. Upgrade: If the air system was installed only a few years ago and has since been rendered less efficient by the increased dimensions of your house, ask a service professional about having the system augmented to match the interior expansion. Replace: If the A/C is old and already showing problem symptoms as you embark on a renovation project, now would be the perfect time to have the air system replaced with an up-to-date and more efficient central air conditioner. In all practicality, air-system costs should be factored into the budget of any renovation project. Discerning homebuyers set their sights on properties with the greatest amount of optimal features, including modern air systems. As such, a home with a more recently installed air conditioner is likely to go for a higher asking price than a home with an outdated A/C. Repair: If real estate values are low in your neighborhood and your main motivation for moving is to get a better home, the most economical option would be to keep your current air system operating for the remainder of your occupancy at the address. Replace: If your house is a valuable property, a new air system could make it even more valuable. A new air system — much like new cedar roofing or a swimming pool — is an attractive feature for any home that goes on the market. 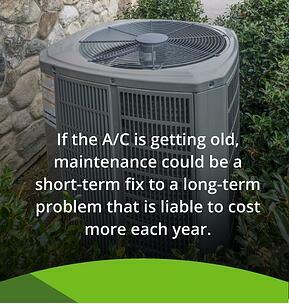 If you are approaching retirement, now could be the perfect time to replace your aging air system. With a new, robust A/C to keep your interior comfortable, you won't have to worry about system failure for years to come, if ever. Unconditioned air can be extremely discomforting for the elderly. The wisest choice is to replace the system now so you can be sure your home stays comfortable every day. At Smart Touch Energy, we provide maintenance on air systems for homeowners in Connecticut, Delaware, Maine, Maryland, Massachusetts, New Hampshire, New Jersey, New York and Rhode Island. Check our prices and place an order or contact us for more information.